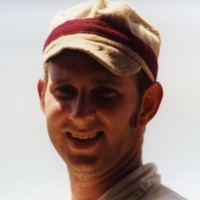 A photograph of Mike Tangel wearing a vintage baseball uniform composed of a red shirt and a white red-striped baseball cap. He is holding two baseball bats. 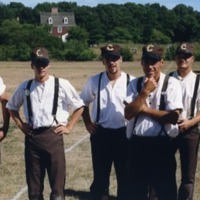 The photograph was taken at the Old Bethpage Village Restoration. A photograph of a woman standing in a garden holding a basket. 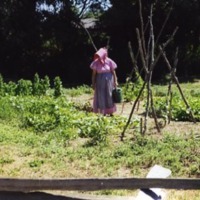 She is wearing a pink bonnet with a dress and grey apron. The photograph was taken at the Old Bethpage Village Restoration. 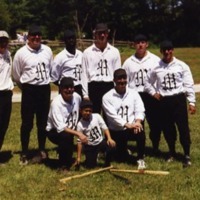 A photograph of the Muffins vintage baseball team taken at the Old Bethpage Village Restoration. 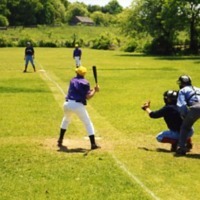 The team uniform is composed of a white shirt with an "M," dark caps, and trousers. 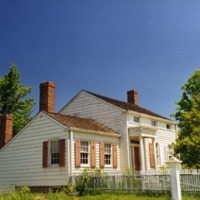 A photograph of a house with a white picket fence, three chimneys, and orange shutters, taken at the Old Bethpage Village Restoration. 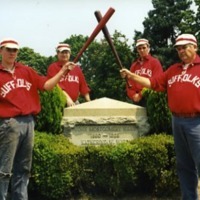 A photograph taken at the Old Bethpage Village Restoration of a vintage baseball team. 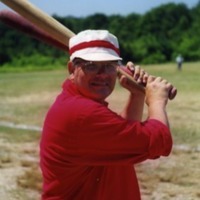 Members are wearing brown trousers with suspenders, white shirts, and brown caps with a "C."
A photograph taken at Old Bethpage Village Restoration of Tom Jordan wearing a vintage white baseball cap with a red band. 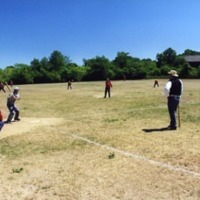 Vintage baseball at Old Bethpage Village Restoration. 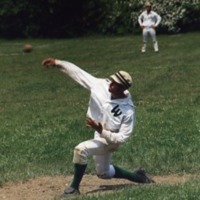 A photograph taken at the Old Bethpage Village Restoration of a vintage baseball pitcher throwing an overhand ball The pitcher is wearing a white uniform with a black "W" on his shirt, and a white cap.